If you are riding a motorcycle, you should be wearing a helmet. Not only can helmets prevent or minimize serious and even deadly closed-head injuries, but California motorcycle laws also require everyone who rides a motorcycle to wear a helmet. But not just any helmet. The helmet must be in compliance with the Federal Motor Vehicle Safety Standard No. 218 (The Department of Transportation and the Snell Memorial Foundation certified helmets comply with the minimum safety standards of FMVSS 218). Be careful if you choose to ride a motorcycle in California without a helmet. Newport Beach motorcycle accident lawyers have seen fines for failure to wear a safety helmet while riding a motorcycle reach in excess of $178. (This violation is a “correctable infraction,” meaning the police officer citing you for the helmet law violation may provide you with a notice to correct the violation.) If you provide proof of correction, then your fine will be significantly reduced. Many bikers prefer not to wear a helmet and may not wear one, even though it is mandated by law. But if you are in an accident resulting in head injury, the at-fault party will claim that you are comparably at fault for failing to protect your head with a helmet. Of course, Newport Beach motorcycle accident attorneys acknowledge that the lack-of-helmet defense is not a defense regarding who caused the accident. Rather, the at-fault party’s argument is that the amount to be awarded should be significantly less or zero because you, as the injured motorcyclist, could have prevented your injury had you worn a helmet. 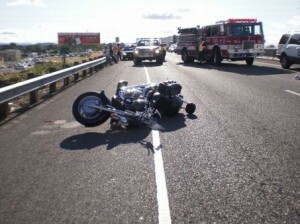 However, Newport Beach motorcycle accident lawyers recognize that not only are you potentially able to recover for injuries unrelated to your head, but you may still be entitled to partial recovery for injuries to your head if they can prove that, even with the helmet, you would have still suffered a head injury. If you have further questions about California helmet laws, contact Russell & Lazarus APC, experienced and knowledgeable Newport Beach motorcycle accident lawyers, at (949) 851-0222.